Real Food Made Simple. Bring Life to Your Table. So for all of you, like me, that have resolved to simply eat cleanly, Paleo, vegan or vegetarian (see alternatives for shrimp below) or even just gluten-free, this is a recipe for you. You can use almost any firm vegetable that you have available. I created this recipe in the late spring, but this time of year instead of squash (which isn't locally available or fresh this time of year in the US), you can use kohlrabi, watermelon radishes (or any other radish), fennel, turnips, golden beets, candy cane (or Chioggia) beets, broccoli and caulfiflower stems or even raw butternut squash. I like it colorful, so instead of butternut squash or gold beets I would use some of the other things since carrots already cover the yellow/orange segment of the color wheel in this recipe. Wondering why no regular purple beets? Because your entire dish will be magenta, but if you like that and that's what you have, then go ahead and use them. If you are not eating meat right now, use tofu or nuts instead of the shrimp. If you are eating paleo, then use spaghetti squash or skip the pasta altogether and double the salad ingredients. Do make peanut sauce to serve with this as it does increase the protein and it is simply yummy! (It also seems to up the kid-cred, too!) Peanut sauce is so easy that my boys now make it on their own and have for years. There are more complicated methods, but how I've taught my kids is to start with 1/3 cup peanut butter and whisk in a couple of tablespoons of very hot water to thin it out. (We follow the eyeballing rule except for in baking.) The key to good peanut sauce is a balance of sweet, salty and sour so next you will add one tablespoon each of soy or tamari (gluten-free soy sauce), agave or honey, and lime juice or rice wine vinegar. Whisk it well then taste it. Add more of each element until you like the flavor. If you like things spicy, add chile garlic paste or red pepper flakes. That's it. Sometimes we will make a vat of this around just do encourage the boys to eat veggies. For Paleo eaters, use spaghetti squash instead of the pasta. For gluten-free, use GF noodles (I used Trader Joe's corn pasta) and for Vegan or vegetarians, leave out the shrimp and toss in some nuts. Combine all the veggies and herbs in a large bowl. Toss with the cooked and cooled spaghetti. Whisk the ginger and garlic into the remaining dressing and toss with the salad. Turn them over and cook until they brown a bit on the other side (just a minute or two). 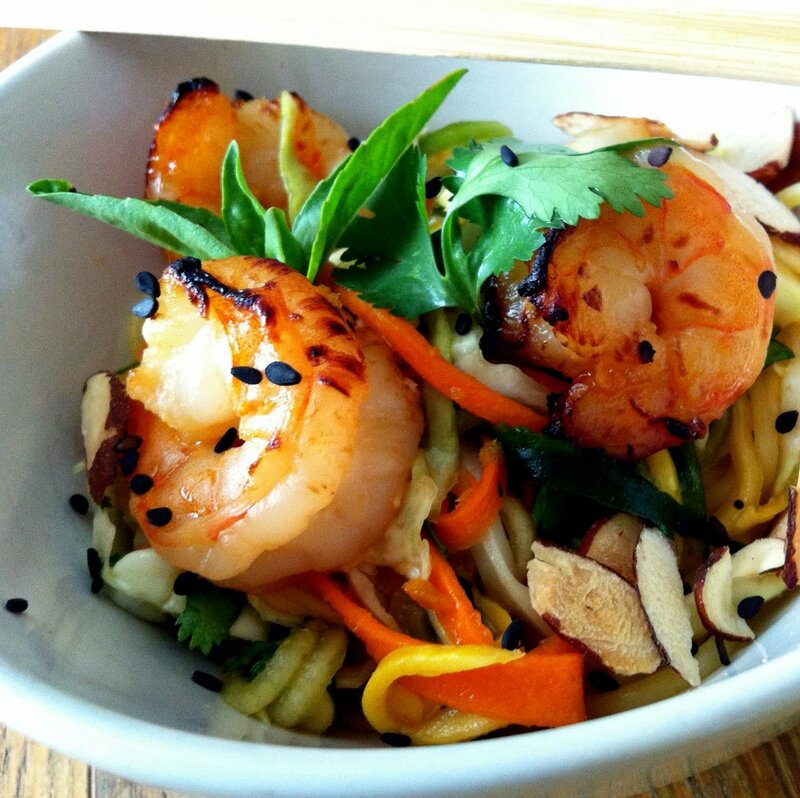 To serve, place a mound of the salad in a shallow bowl and top with shrimp, sliced almonds and sesame seeds. Pass peanut sauce if you're using. If you are in the Dallas Fort Worth area, I will let you know when I will be holding local classes.